For the last eight years, Mahmoud Ahmadinejad has been the villain of choice for many Western leaders. The familiar image of the bearded and finger-jabbing President has been the backdrop for countless scaremongering stories about Iran's alleged nuclear threat or his rhetorical threats to see Israel ‘wiped off the map’. After June 14th, politicians in the West will have to get used to caricaturing another Iranian leader as Ahmadinejad has come to the end of his two-term maximum as President. That date sees 48 million Iranian voters go the polls in the first presidential election since the tumultuous vote of 2009. That event witnessed the biggest upsurge of class struggle in Iran since the 1979 revolution which brought to power the current regime of the Ayatollahs. The run-up to this month's vote has seen a jostling for position among the various factions which form the ruling elite but these are united in their unspoken fear of a repeat of 2009. None of the six officially sanctioned candidates could be unreservedly supported by socialists. However, even this flawed electoral process opens up the possibility that fissures among the ruling class could enable the Iranian left to find its voice again after the crushing of the movement four years ago. The election is for the position of President but this is not the most powerful office in the Iranian constitution. That is taken by the unelected Supreme Leader. Ali Khamenei has retained this role since 1989 and is the dominant personality in the state. He presides over the twelve men Guardian Council which is also unelected. This is made up of six Islamic clergy and six jurists who vet all presidential candidates to ensure they are acceptable to the elite. There are six candidates for the June 14th vote so the process has a democratic veneer, but in reality all the candidates are approved by Khamenei and his clique. This vetting process has been the focus of shifting alliances within the Iranian ruling class. Ahmadinejad may have become the face of the regime to the outside world but he actually represents a faction that has recently fallen out of favour with Khamenei. The latter is the leader of a group known as the Principalists, who have dominated Iranian politics since the revolution. They are the voice of the Islamic clergy who rose to power on the back of the 1979 movement that toppled the monarchy. Strategic blunders by the left at that time allowed a petit-bourgeois class alliance of the mullahs and small businessmen-known as bazarris to hijack the revolution and install a theocratic dictatorship to stabilise Iranian capitalism. The Principalists are the custodians of this counter-revolution. Their preferred candidate this year is Saeed Jalili, Iran’s chief negotiator with the UN in its long-running stand-off over nuclear power. Polling before the election pointed to Jalili as the most likely winner. This dominant faction is also backing Bagher Ghalibaf, the Mayor of Tehran, as a back-up candidate. He is Iran’s answer to Boris Johnson-an eccentric maverick but ultimately loyal to the establishment. Ahmadinejad came to power in 2005 because he had the backing of Khamenei and the Principalists but subsequently he has fallen out of favour, partly because of their suspicion that he was developing an independent power base beyond the control of the clergy. Ahmadinejad has increasingly deployed nationalist rhetoric as his appeal to voters, as opposed to the traditional religious language of the mullahs. This secular emphasis has provoked Khamenei's distrust of him, alongside squabbles between the two factions over corruption in the Iranian Parliament. Ahmadinejad had designated Rahim Mashaei as his preferred successor but the Guardian Council formalised the eclipse of the outgoing President by recently barring his nominee from even entering the race. This symbolises the defeat of the 'nationalist' faction at the hands of the resurgent Principalists. The latter represent the first generation of post-revolutionary leaders and therefore the marginalisation of Ahmadinejad also points to the failure of the second generation to make a political breakthrough. "We will open all the locks which have been fastened upon people's lives during the past eight years... You, dear students and hero youth, are the ones who have come to restore the national economy and improve the people's living standards. We will bring back our country to the dignity of the past." At best, however, Rouhani is a wily centrist who has cleverly perceived the Ahmadinejad faction is on the way out. Rouhani has been careful to avoid any hint of criticism of the Supreme Leader and would certainly not been interested in mass mobilisation on the scale of 2009. The vetting process by the Guardian Council is designed to ensure that even so-called reformists are ultimately compliant with Khamenei. Rouhani has generated a significant groundswell of support but the best he can reasonably hope for is to force a run-off election with one of the Principalist candidates. His prospects have been marginally enhanced by the decision of the only other reformist candidate, Mohammad Aref, to withdraw a few days before the poll on the advice of former President Mohammad Khatami, the spiritual leader of the opposition movement. Rouhani is the least worst option for the reformists whose preferred leaders, Hossein Mousavi and Mehdi Karoubi, remain imprisoned by the regime after their part in 2009 uprising. That event can be partly interpreted as a precursor of the Arab Spring rebellions that would unfold two years later. 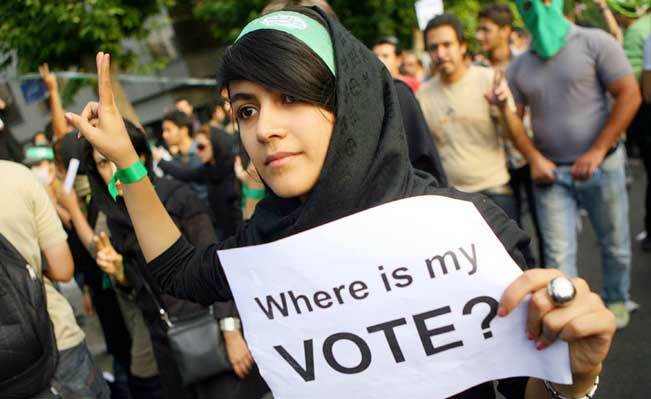 An estimated half a million protesters filled the streets of Tehran and other major cities in July of that year after allegations of widespread vote-rigging by Ahmadinejad and the ruling faction in the presidential election. With the slogan 'where is my vote?' the uprising was the biggest challenge to the Ayatollahs so far and its violent suppression led to scores of deaths. The rebellion was particularly notable for the active participation of educated youth and the ultimate fear of the regime in 2013 will be that this section of society will once more defy a sclerotic elite. The current generation have the advantage of witnessing the toppling of other Middle East dictatorships in Tunisia and Egypt, and also the recent protests in nearby Turkey. Obama's insistence on exaggerating the Iranian threat has enabled the regime to wrap itself in the banner of nationalism. Principalist candidates have campaigned with pictures of a number of Iranian scientists murdered by unknown assailants (most likely the Israeli secret service) for their alleged role in the building of a nuclear bomb. Iranians have long memories of duplicitous Western interference, most notably the CIA organised plot to depose the elected liberal Prime Minister, Mohammad Mossadeq, in 1953. The West’s consideration of arming the anti-government forces in neighbouring Syria also looks like a step closer to an attack on Iran to many voters. The reformist movement in today's Iran has to tread carefully to avoid being outmanoeuvred by the patriotic rhetoric of the Principalists.